Design rainfall comprises of a depth and duration associated with a given probability of exceedance or return period. The purpose of the study was to evaluate and compare the methods used in flood hydrology to estimate depth-duration-frequency (DDF) relationships of design rainfall in South Africa based on the critical storm duration or time of concentration (TC) of a catchment. The influence of the type of rainfall, areal and temporal distribution of rainfall were also investigated to establish if a relationship exists between the catchment area, TC and areal reduction factors (ARFs). The DDF relationships based on the least-square regression analyses of Log-Extreme Value Type 1 distributions, the modified Hershfield equation, the regionalised South African Weather Service (SAWS) n-day design rainfall data and the Regional Linear Moment Algorithm and Scale Invariance (RLMA&SI) approach were compared in 3 distinctive TC-ranges. The results showed that the RMLA&SI approach can be considered as the preferred DDF relationship in future design flood estimations. The results also showed that a direct relationship exists between the catchment area and TC, thus ARFs can be explicitly expressed in terms of only the catchment area. Design rainfall comprises of a depth and duration associated with a given probability of exceedance or return period. Short and long duration design rainfall estimations can either be based on point or regionalised data. Rainfall durations less than 24 h are generally classified as short, while long durations typically range from 1 to 7 days (Smithers and Schulze, 2004). Several regional and national scale studies in South Africa based on short durations and point data were conducted between 1945 and 2001. The studies focusing on long durations based on daily point rainfall data included studies done by the SAWB (South African Weather Bureau) (1956), Schulze (1980), Adamson (1981), Pegram and Adamson (1988) and Smithers and Schulze (2000b). Smithers and Schulze (2000a; 2000b) also used a regionalised approach in an attempt to increase the reliability of the design values at gauged sites, as well as for the estimation of design values at ungauged sites (Smithers and Schulze, 2003). Irrespective of whether a single site or regional approach is followed, the design rainfall depth to be used in design flood estimation, especially in the deterministic methods, must be based on the critical storm duration or time of concentration (TC) of a catchment. This paper attempts to provide preliminary insight into the applicability of the various methods used in South Africa to estimate design rainfall. The purpose of the study is discussed and explained in the next section, followed by an overview of the study area's spatial distribution and characteristics. 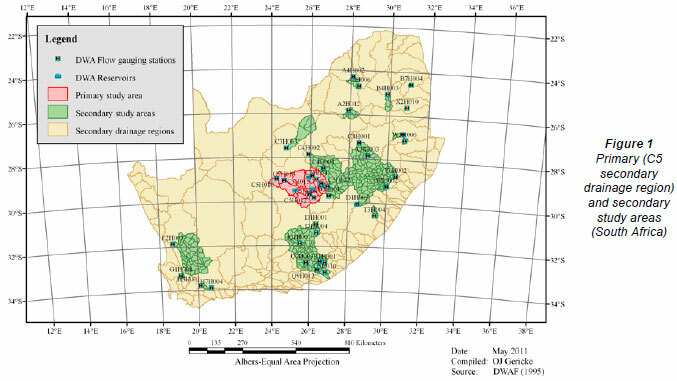 Thereafter, the methods used in South Africa to estimate TC, depth-duration-frequency (DDF) relationships and areal reduction factors (ARFs) are reviewed in detail. The methodologies involved in assessing the paper's purpose and objectives are then expanded on in detail, followed by the results, discussion, conclusions and recommendations. The purpose of the study was to evaluate the methods used in flood hydrology to estimate DDF relationships of design rainfall in South Africa, based on the critical storm duration or TC of a catchment, in 3 distinctive TC-ranges. The focus was not necessarily to establish the best method; the results from the different methods were compared to highlight any inherent shortcomings present in these methods. In catchments where TC exceeded 24 h, the different methods were compared to the regionalised South African Weather Service (SAWS) daily design rainfall database (after Smithers and Schulze, 2000b). For TC less than 24 h, the Regional Linear Moment Algorithm and Scale Invariance (RLMA&SI) approach for estimating design rainfall (after Smithers and Schulze, 2000a) was used as the reference method. These 2 reference methods were used to assess the relative accuracy of all the other available methods. The influences of the type of rainfall and point-to-point differences in the areal and temporal distribution of rainfall were also investigated. This was done to establish whether a relationship exists between the catchment area, TC and ARFs. Firstly, it was hypothesised that runoff depends not only on the amount and intensity of rainfall, but is also affected by the duration, size, uniformity, velocity and direction of a storm passing over a catchment. Secondly, it was hypothesised that flood-causing storms have durations just long enough to allow runoff from all parts of the catchment to contribute simultaneously to the flood peak; hence the relationship between the critical duration of a storm and TC. Thirdly, it was hypothesised that flood-producing storm rainfall is almost never evenly distributed, both in time and space, over an area. Lastly, it was hypothesised that water engineers and other consultants (not necessarily hydrologists) tend to use only well-known and simplified DDF relationships to estimate design rainfall depths, irrespective of whether numerical or graphical procedures are used. This is probably due to the direct statistical analysis that needs to be conducted to convert daily observed point rainfall to a design rainfall depth associated with TC, as well as the uncertainty of the relative applicability thereof and whether the rainfall magnitude-frequency relationships will be satisfactorily accommodated in these alternatives. In addition, Weddepohl (1988), highlighted that the malfunctioning of rainfall gauges, the spatial density and distribution of rainfall gauges, sporadic rainfall events as opposed to the continuous digitised data in use, length of available records and the presence of outliers are all problems inherently contributing to errors in rainfall and subsequently the tendency to use existing DDF relationships to estimate design rainfall in South Africa. The primary study area covers 34 795 km2, between 28º25' and 30º17' South and 23º49' and 27º00' East and comprises the C5 secondary drainage region in South Africa. The Riet River and Modder River catchments are the 2 tertiary catchments in the main study area. The area is characterised by the fol land uses: 99.1% rural, 0.7% urbanised and 0.2% water bodies (CSIR, 2001). The natural vegetation is dominated by Grassland of the interior plateau, False Karoo and Karoo (light bush). Cultivated land is the largest human-induced vegetation alteration in the rural areas, while residential and suburban lowingareas dominate the urban areas. The topography is gentle (slopes between 2.4% and 5.5%) and water tends to pool easily, thus influencing the attenuation and translation of floods. The mean annual precipitation (MAP) is 424 mm, ranging from 275 mm in the west to 685 mm in the east. It is characterised as highly variable and unpredictable. The rainy season is from early September to mid-April, with a dry winter (Midgley et al., 1994). 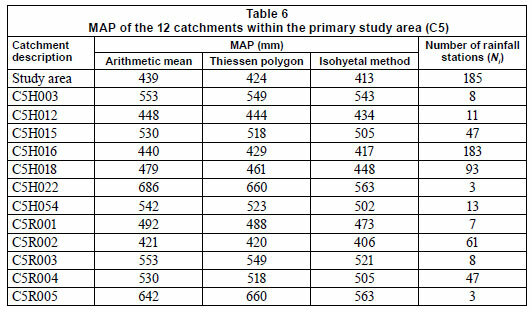 To enhance the understanding of the results obtained from this study, as well as to illustrate the relevance thereof in a South African context in different climatic regions, 29 additional catchments, ranging from 28 km2 to 29 328 km2, were randomly selected in South Africa as secondary study areas.The results (catchment areas and TC) from previous research conducted by Petras and Du Plessis (1987) and Parak and Pegram (2006) were used as default input parameters to evaluate the current DDF relationships in use. The location of the primary and secondary study areas is shown in Fig. 1. The following provides a review of the methods used in South Africa to estimate TC, DDF relationships and ARFs. TC (Eq. (1)) can be defined as the time required for runoff, as a result of rainfall with a uniform areal and temporal distribution, to contribute to the peak discharge at the catchment outlet. Thus, the time required for a water particle to travel from the catchment boundary along the longest watercourse to the catchment outlet (Rooseboom et al., 1993; SANRAL, 2006). In determining TC, overland flow and/or flow in defined watercourses and/or artificial/man-made canals (urban areas) can occur. The roughness coefficient (r) depends on the land use or cover along the flow path, and typically varies between 0.02 (paved areas) to 0.8 (thick grass cover) (SANRAL, 2006). It is similar to Manning's n-value and, according to McCuen (2005), representative roughness coefficient values can be estimated by selecting a basic roughness coefficient value followed by a 5-step correction process, whereby the coefficients are corrected for flow path irregularities and variations, presence of obstructions, vegetation differences and flow path meandering. Channel flow occurs in a defined watercourse. The United States Department of Agriculture Soil Conservation Service (USDA-SCS) recommends the use of Eq. (3), while Kirpich (1940) recommends the use of Eq. (4) to determine TC in a natural, defined watercourse. In urban areas or artificial/man-made canals, TC must be based on the calculated flow velocity estimated using the Chézy or Manning equations. Permissible velocity ranges, based on the material used, must be adhered to (Rooseboom et al., 1993; SANRAL, 2006) and TC for flow in artificial/ man-made canals can be estimated using Eq. (5) (SANRAL, 2006). Midgley and Pitman (1978), referred to as M&P in this paper, developed a DDF coaxial diagram (Fig. 2) in which the design point rainfall is a function of the critical storm duration (TC), regional location (regional factors), probability of exceedance (frequency factors) and MAP. 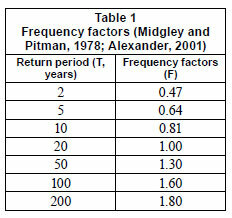 The frequency factors (F), based on the relationship between the design rainfall depths and various return periods, are listed in Table 1. The 1, 2, 3 and 7-day extreme design rainfall depths for return periods of 2, 5, 10, 20, 50, 100 and 200 years were estimated by Adamson (1981) using approximately 2 400 rainfall stations. A censored Log-Normal (LN) distribution based on the Partial Duration Series (PDS) was used in this study to estimate the design rainfall depths at a single site. According to Adamson (1981), the daily rainfall depth recorded at fixed 24-h intervals can be converted to a continuous 24-h rainfall depth by making use of the relationship provided in Eq. (10). However, this approach is outdated and Smithers and Schulze (2000a) developed regionalised relationships for 15 relatively homogeneous rainfall regions in South Africa, with a national average of 1.21. 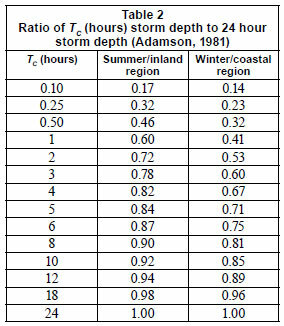 The computed ratios for the TC(hour) duration storm depth to that for 24 h, for the summer/inland and winter/coastal rainfall regions, are listed in Table 2. 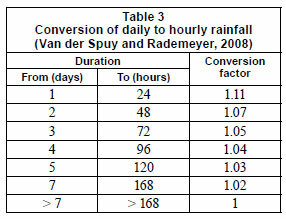 Converting daily design rainfall depths to durations longer than 1 day simply entails the conversion of fixed interval to continuous measurement (e.g.1 day to 24 h, 2 days to 48 h), and interpolating between the different duration (h) rainfall depths as given in Table 3. However, this simple approach is outdated and no literature is available as to how these ratios were derived. In the next section, the regional approach proposed by Smithers and Schulze (2000b) is discussed as the preferred design rainfall database to TR102. Smithers and Schulze (2000b) conducted direct statistical analyses based on the General Extreme Value (GEV) probability distribution, at 1 789 rainfall stations with at least 40 years of record, to estimate the 1-day design rainfall values in South Africa. This was followed by a regionalisation process (based on Linear-Moments) and establishment of 78 relatively homogeneous rainfall regions and associated index values derived from at-site data. Quantile growth curves, representative of the ratio between design rainfall depth and an index storm to return period, were developed for each of the homogeneous rainfall regions and storm durations of 1 to 7 days. These regionalised growth curves and the at-site index values were then used to estimate design rainfall depths at 3 946 rainfall stations in South Africa (Smithers and Schulze, 2000b). 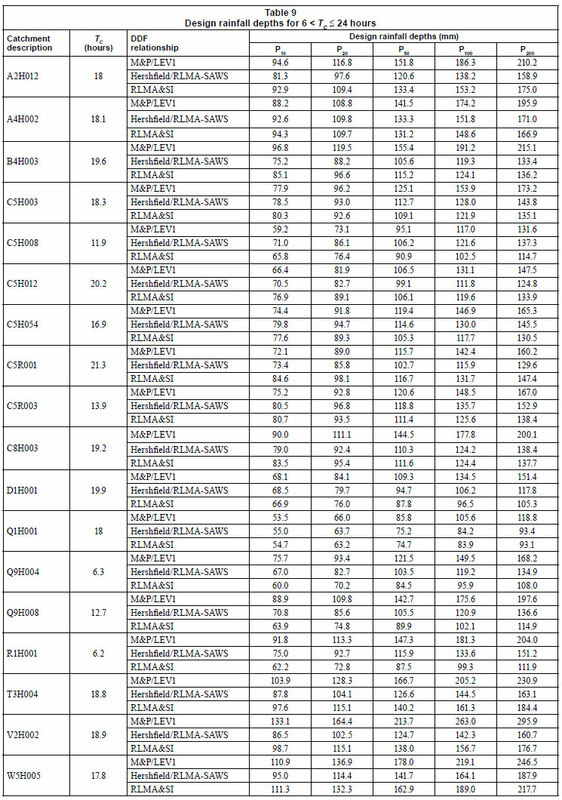 In this paper, the 3 946 rainfall stations are collectively referred to as the Regional L-Moment Algorithm SAWS n-day design point rainfall database (RLMA-SAWS), since the majority (82.2%) of the daily rainfall stations used, were contributed by the SAWS. The remaining daily rainfall data were provided by the Institute for Soil, Climate and Water (ISCW), the South African Sugar Association Experiment Station (SASEX) and private individuals (Smithers and Schulze, 2000b). Alexander (2001) proposed that the modified Hershfield equation (Eq. (11)) must be used to calculate the DDF relationships for durations less than 6 h. For rainfall durations longer than 6 h and less than 24 h, Alexander (2001) recommends linear interpolation between Eq. 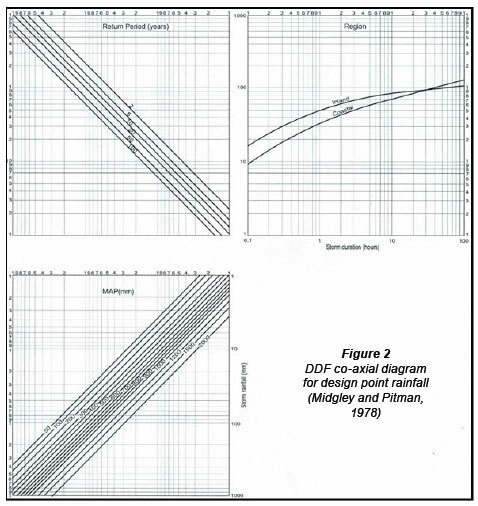 (11) and the 1-day design point rainfall depth from TR102 (Adamson, 1981). If TC exceeds 24 h, then linear interpolation between the n-day design point rainfall depth values must be used. In this paper, the RLMA-SAWS database (after Smithers and Schulze, 2000b) was used instead of TR102, since this database has ± 20 years more data at 3 946 rainfall stations. Regional approaches are well established in frequency analysis and various different techniques are available. The use of the RLMA approach by Smithers and Schulze (2000b), to estimate long duration design rainfall, was highlighted in a previous section. The same approach was followed to estimate short duration (< 24 h) design rainfall in South Africa, but it was based on digitised rainfall data from 172 stations which had at least 10 years of data (Smithers and S chulze, 2003; 2004). A scale invariance approach, where the mean Annual Maximum Series (AMS) for any duration can be estimated by firstly estimating the mean 1-day AMS at a single site by regional regression, followed by scaling either the mean AMS for durations shorter or longer than 1 day, respectively, from the 24 h and 1 day values, were used in conjunction with RLMA. This application is referred to as the Regional Linear Moment Algorithm and Scale Invariance (RLMA&SI) approach. A software program, 'Design Rainfall Estimation in South Africa' was developed in 2003 to facilitate the estimation of design rainfall depths at a spatial resolution of 1-arc minute, for any location in South Africa, based on the RLMA&SI approach, for durations ranging from 5 min to 7 days and for return periods of 2 to 200 years (Smithers and Schulze, 2003; 2004). Design point rainfall estimates are only representative for a limited area, and for larger areas the areal average design rainfall depths or intensities are likely to be less than the maximum observed point rainfall depths or intensities. 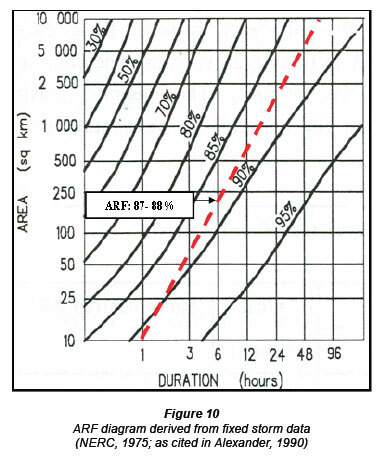 The estimation of ARFs is concerned with the relationship between the design point and areal rainfall; in other words, ARFs are used to convert design point rainfall depth/intensity to average areal design rainfall depth/intensity for a given duration and catchment area (Alexander, 2001). In small catchment areas, of less than 800 km2, the ARF is mainly a function of the area and design point rainfall intensity, since the relationship between rainfall intensity and the infiltration rate of the soil is predominant. In medium to large catchment areas, up to 30 000 km2, the ARF is mainly a function of the area and storm duration, since the quantity of rainfall relative to the number of storage areas is of great importance. In both cases, the ARF decreases in value with an increase in area and is independent of the return period and geographical location. These relationships are clearly evident from the ARF graphs included in the Drainage Manual (SANRAL, 2006). These graphs are based on a variable location, stormcentred analysis, as conducted by the HRU (1972). However, this approach posed conceptual problems when applied to a geographically-fixed catchment and the use of a correction factor was suggested (Alexander, 2001). In response, Alexander (1980) developed a geographically-centred ARF relationship based on the ARFs contained in the United Kingdom Flood Studies Report (UK FSR) (NERC, 1975). This developed ARF relationship (Eq. (12)), as a function of the catchment area and response time in terms of TC, resulted in slightly more conservative results when compared to the UK FSR and United States Weather Bureau (USWB) values (Alexander, 2001). In Eq. (12) the ARF relationship accommodates severe storm mechanisms producing very high intensity rainfall with cell core areas exceeding 10 km2 and durations exceeding 10 min. Estimates of shorter duration rainfall based on extrapolation from longer durations are unreliable when viewed in the light of the storm mechanisms which produce high-intensity rainfall for durations less than 10 min (Alexander, 2001). This section provides the detailed methodology followed during this study and is based on the theoretical methods reviewed in the previous section. 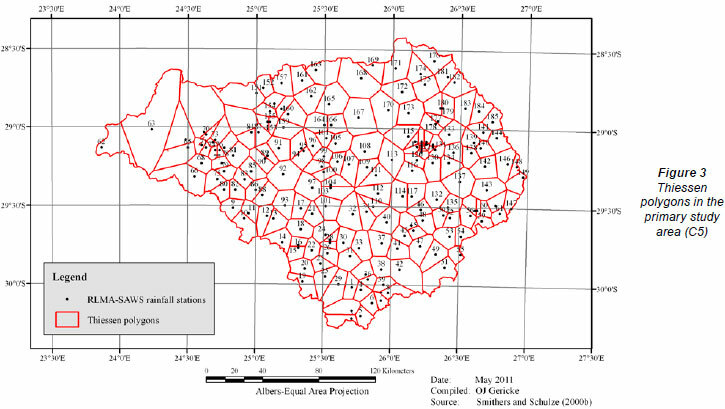 The arithmetic mean, Thiessen polygon and isohyetal methods were used to convert the point design rainfall depths at 185 rainfall stations (from RLMA-SAWS database) to an average design rainfall depth over the main study area (C5 secondary drainage region). The details (station number, record length, MAP and Thiessen polygon area) of the above-mentioned 185 rainfall stations are listed in Table 4. The same procedure was also followed in 12 quaternary catchments within the main study area. The 29 secondary study areas were analysed similarly, but without using the isohyetal method. A flow gauging station from the Department of Water Affairs (DWA) is situated at the outlet of all the catchments used in the study. The flow gauging station numbers were therefore used as the catchment identifier or descriptor for easy reference. The Areal Rain extension in ArcView 3.2a was used to generate Thiessen polygons representative of the averaged design rainfall depths for a particular area (catchment) from design point rainfall measurements. The boundary of the resultant Thiessen polygons was selected in each case either by the applicable quaternary catchments (polygon feature classes) or by a buffered group of rainfall stations (point feature classes). The latter option provides an alternative that allows the user to include rainfall stations located outside the catchment boundary. The rainfall station number field in the attribute table of the point feature class (rainfall stations) was used to identify points and rainfall. The attribute table was then automatically updated; fields (Thiessen area, total area, weighted area, Thiessen and areal rainfall) were added with the geometry (area) being calculated. These attribute tables were then exported as a database file (dbf) to use Microsoft Excel for further computations. 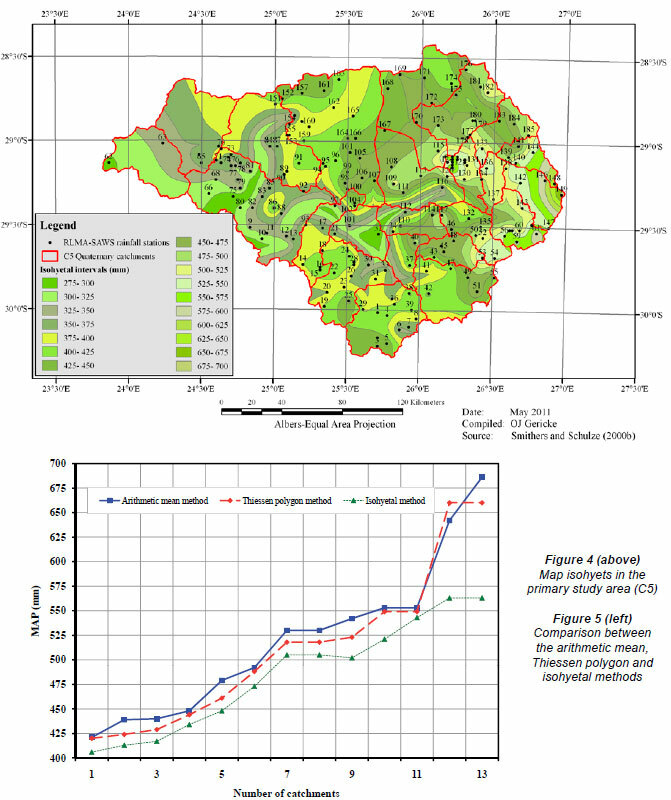 In the case of the isohyetal method, the Spatial Analyst Tools (Interpolation and Reclass) extension in ArcGISTM 9.3 was used to generate and reclassify a MAP Raster (based on the design point rainfall depths at 3 946 rainfall stations contained in RLMA-SAWS database) at a defined isohyetal interval of 25 mm. The raster was based on a cell matrix approach, which represents the maximum change in design rainfall over the distance between the cell and its 8 neighbouring cells, thus representative of the maximum average design rainfall for each cell. The Conversion Tools extension was then used to convert the raster to a polygon feature class to enable the determination of the areas associated with each isohyetal interval or MAP range.  Step 1 - The averaged design rainfall representative of the average meteorological conditions in each catchment was estimated by using the Thiessen polygon method applied to all of the daily design rainfall stations (from the RLMA-SAWS database) within the catchment boundary. Both the MAP and average design rainfall depths (for storm durations of 1 to 7 days) were estimated.  Step 2 - A single rainfall station, with a sufficiently long record length and which is representative of the average meteorological conditions as estimated in Step 1, was then selected from those stations used in Step 1 as the base station to estimate the RLMA&SI gridded design point rainfall values.  Step 3 - With the single rainfall station as selected in Step 2, the appropriate storm durations (5 min to 7 days), return periods (2 to 200 years) and block size (spatial resolution of 1'x1' grid points) were selected. The block size was specified in such a way that the whole extent of each catchment under consideration was covered with grid points.  Step 4 - Lastly, the gridded point values for each storm duration and return period under consideration were converted to an averaged catchment value by making use of the arithmetic mean. The critical storm duration in each case was determined by using Eq. (3), which represents TC in a natural, defined watercourse. All of the catchments evaluated can be classified as medium to large (only 5% of the catchments have areas while SANRAL (2006) also recommends the use thereof. The degree of association between these 2 equations is high, but Eq. (4) tends to underestimate the TC-values compared to Eq. (3). Consequently, this will result in higher peak discharge estimations. The use of Eq. (5) was discarded, since all of the catchments are rural, with no or a few artificial/man-made canals. In addition, the use of Eq. (5) is very sensitive to selecting the appropriate surface roughness parameter in terms of the Manning's (n) and/or Chézy's (ks) coefficients. In the case of overland flow, an increase in surface roughness will result in flow retention and subsequently higher potential infiltration rates. An increased roughness in channels will result in lower velocities, deeper flow depths and higher associated flood levels, and a possible reduction in erosion or sediment transport (McCuen, 2005). Thus, the DDF relationships were then categorised according to 3 TC-ranges; TC< 6h, 6 < TC< 24 h and 24< TC< 168 h.
The ARF in each catchment under consideration, in other words the conversion of design point rainfall depths or intensities to average areal design rainfall depths or intensities, was established by using Eq. (12). The validity of this equation was assessed by plotting TC within each catchment under consideration against the catchment area, after which it was superimposed on both an ARF curve based on Eq. (12) and the ARF diagram as published in the UK FSR (NERC, 1975). The average number of days per year on which thunder was heard (R) is an input parameter required by the modified Hershfield equation (Eq. 11). This parameter is associated with the type of rainfall, e.g. convective rainfall is normally associated with a higher degree of thunder activities than, for instance, frontal rain. The R-values used in this study were based on the climate data as published in the SAWB publication WB 42 (SAWB, 1992) and the generalised isohyetal map contained in Alexander (2001). There are 280 rainfall stations with associated R-values in WB 42, thus representing only ± 7% of the total number of rainfall stations available in the RLMA-SAWS database as developed by Smithers and Schulze (2000b). Soil Conservation Services (SCS) method (Schulze et al., 1992). Typically, the Type 1 and 2 storm distributions apply to coastal areas with winter rainfall or rainfall throughout the year (frontal), while the Type 3 and 4 storm distributions apply to inland areas characterised by high design rainfall intensities and convection activity. This was done by superimposing the 'Area distribution of storm types in South Africa' map over the 'SAWS rainfall station reference grid' map (SANRAL, 2006). The R and the 2-year mean of the annual daily maxima rainfall (M) values were then plotted against one another to establish whether any direct relationship exists which can be used to express the R-values in terms of the M-values. The anticipated results will thus exclude the degree of uncertainty associated with the selection of default R-values based on location only. 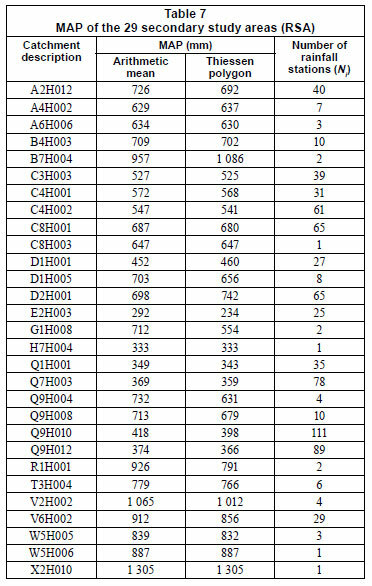 The results of the averaged design rainfall depth calculations applicable to the primary and secondary study areas are listed in Tables 5, 6 and 7 respectively. Figures 3 and 4 are illustrative of the Thiessen polygon and isohyetal weighted areas and location of the daily design rainfall stations within the primary study area, while Fig. 5 serves as a visual comparison between the arithmetic mean, Thiessen polygon and isohyetal methods. The number of rainfall stations used for averaging the rainfall varied from catchment to catchment with an overall average of 1 station per 100 km2. The arithmetic mean values exceeded both the Thiessen polygon and isohyetal values in all of the catchments, with the exception of C5R005. However, this was also the only catchment where the polygons and isohyets were based on rainfall stations within and outside the catchment boundary. The percentage differences between the arithmetic mean and Thiessen polygon methods varied between -3% and 4%, while the arithmetic mean and isohyetal method differed with between 2% and 22%. Similar trends were evident between the Thiessen polygon and isohyetal methods, with differences between 1% and 17%. Despite these percentage differences, the coefficient of determination (r2) varied between 0.90 and 0.98, which is indicative of an overall high degree of association between these methods. This also confirmed the even areal distribution of the rainfall stations and the relatively flat topography of the C5 secondary drainage region (main study area). Similar results were evident in the secondary study areas. The design rainfall depths for critical catchment storm durations, estimated using the various DDF relationships for the specific catchments evaluated in the primary and secondary study areas, are listed in Tables 8 to 10. 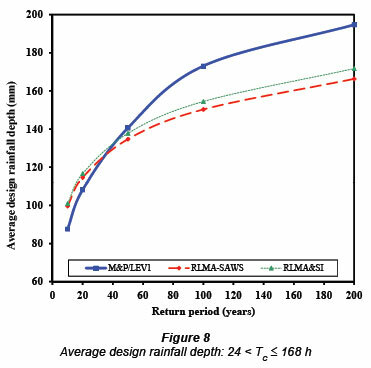 The results in Table 8 (TC< 6 h) indicated that the design rainfall estimated according to the M&P/LEV1 relationship overestimated the design rainfall depths for all the return periods, when compared to the estimates using the modified Hershfield equation and the RMLA&SI approach, except at the 10- to 50-year return periods in Catchments A6H006 and C5H022. In Catchment H7H004, M&P/LEV1 underestimated all of the design rainfall depths when compared to the 2 other approaches. The coefficient of determination (r2) was a constant value of 0.76 for each return period when the M&P/LEV1 and Hershfield methodologies within the critical storm duration range under consideration were compared. The degree of association between the M&P/LEV1 and RMLA&SI relationships decreased from 0.77 (10-year) to 0.71 (200-year). Compared to the RLMA&SI approach, the modified Hershfield equation generally slightly underestimated the design rainfall depths for the 10- and 20-year return periods in catchment G1H008, while all of the return periods in Catchment H7H004 were underestimated. The rainfall depths were slightly overestimated in the remaining catchments. The degree of association between these 2 methods was high, since the coefficient of determination varied between 0.93 at the 10-year return period and decreased to 0.87 at the 200-year return period. Figure 6 is illustrative of the average design rainfall depths based on the 3 DDF relationships within the critical storm duration range; TC< 6 h for all of the catchments listed in Table 8. The results in Table 9 (6 < TC< 24 h) showed that all the DDF relationships under consideration demonstrated, on average, similar trends, as in the case of the critical storm duration range, TC< 6 h, but the overall degree of association was lower. 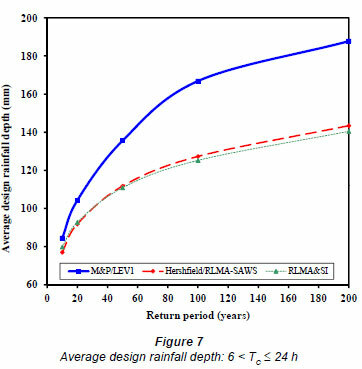 The design rainfall depths based on the M&P/LEV1 relationship were overestimated for all of the return periods, in comparison to the linear interpolation between the modified Hershfield equation and the 1-day point rainfall depths from the RLMA-SAWS database and the RMLA&SI approach. However, the M&P/LEV1 relationship underestimated the 10- and 20-year design rainfall depths in Catchments A4H002, C5H012, C5H054, C5R001 and C5R003. As in the case of TC< 6 h, a constant coefficient of determination (r2 = 0.53) was evident between the M&P/ LEV1 and Hershfield/RLMA-SAWS relationships. The comparison between the M&P/LEV1 and RLMA&SI relationships confirmed that the degree of association was similar, as in the latter case, although the r2-values increased with an increase in return period. The Hershfield/RLMA-SAWS relationship overestimated the design rainfall depths for the full range of return periods under consideration, in comparison to the RLMA&SI relationship in 39% of the catchments. The design rainfall depths were also underestimated in 39% of the catchments, while the results in the remaining 22% of the catchments (A4H002, C5H003, C8H003 and Q1H001) were characterised by an almost perfect fit. The degree of association was acceptable; the r2-values varied from 0.80 at the 10-year return period and decreased to 0.69 at the 200-year return period. 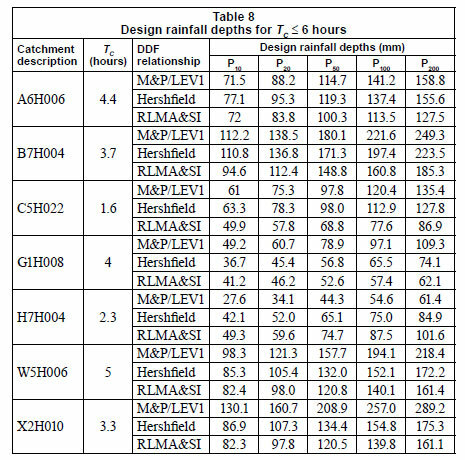 Figure 7 is illustrative of the average design rainfall depths based on the 3 DDF relationships within the critical storm duration range, 6 < TC< 24 h for all of the catchments listed in Table 9. 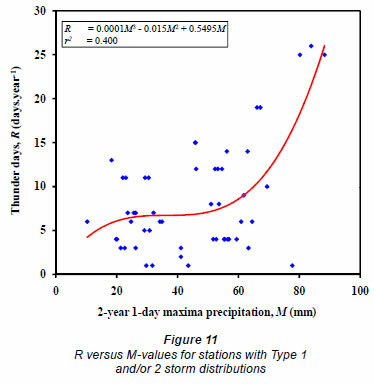 The results in Table 10 (24 < TC< 168 h) indicated that the M&P/LEV1 relationship overestimated the design rainfall depths for the 50-, 100- and 200-year return periods up to a critical storm duration of 50 h, compared to the linear interpolated RLMA-SAWS n-day design point rainfall depths and the RLMA&SI approach. All of the design rainfall depths with critical storm durations of or exceeding 100 h were underestimated, except in Catchments C8H001, D2H001 and Q9H012. In Catchment D2H001 all of the design rainfall depths were overestimated, while only the 50-, 100- and 200-year return periods were overestimated in the other 2 catchments. The degree of association between these methods was low, since the coefficient of determination varied between 0.60 (10-year) and decreased to 0.49 (200-year), in the case of the M&P/LEV1 and RLMA-SAWS comparison, while in the case of the M&P/LEV1 and RMLA&SI comparison the coefficient of determination varied between 0.75 (10-year) and increased to 0.77 at the 200-year return period. The comparison between the RLMA&SI and the linear-interpolated RLMA-SAWS n-day design point rainfall depths were characterised by a high degree of association; the coefficient of determination varied between 0.85 at the 10-year return period and decreased t 0.72 at the 200-year return period. 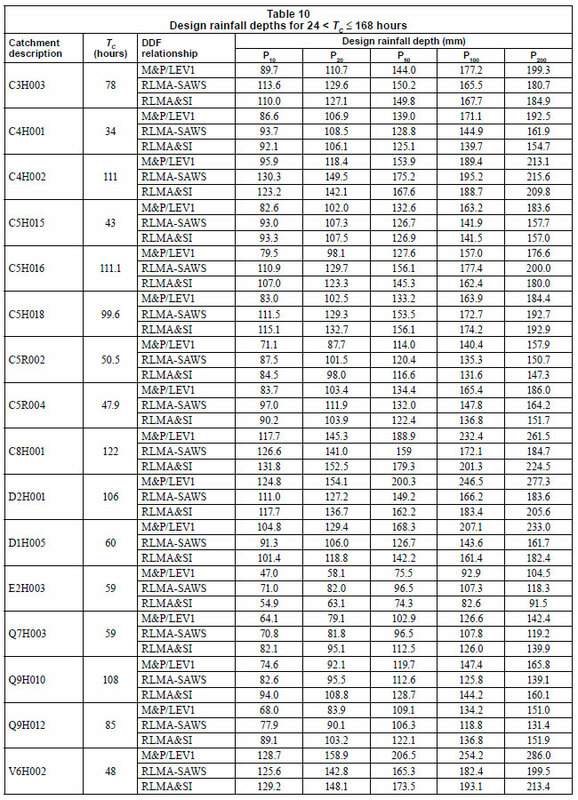 Figure 8 is illustrative of the average design rainfall depths based on the 3 DDF relationships within the critical storm duration range, 24 < TC< 168 h for all of the catchments listed in Table 10. In the methodology it was highlighted that the RLMA&SI gridded design point rainfall values were converted into average catchment values by using a 4-step process. 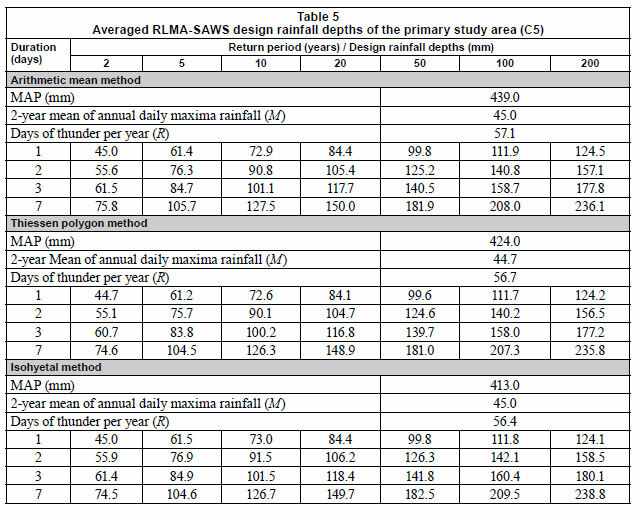 In order to establish the applicability thereof, the RLMA&SI design rainfall depth results in 4 of the 29 secondary study areas were compared to the results obtained by Parak and Pegram (2006). The TC values were plotted against the associated catchment areas on a double log graph and a straight line fit represented by a power function was fitted through the data points. Eq. (12) is represented by a power function equal to the 1:1 trend line; in other words, the coefficient of determination equals unity. The results also showed a high degree of association between Eq. (15a) and the clustered points, with the r2-value equal to 0.93. The power-law relationship associated with this r2 value can alternatively also be expressed as Eq. (15b), which provides a good indication of TC associated with any catchment area under consideration. Eq. (16) resulted from the substitution and simplification of Eq. (15b) into Eq. (12). A summary of the applicable results is shown in Table 11, and Fig. 9 illustrates the fitted power-law relationship. Figure 10 represents the ARF diagram published in the UK FSR (NERC, 1975) with Fig. 9, the area-duration powerlaw curve, superimposed thereon. 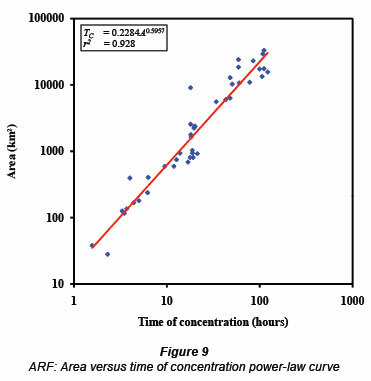 It is clearly evident that this power-law curve yielded a constant ARF, of between 87% and 88%, across the ARF diagram, for durations exceeding 3 h. This implies that, for the catchments under consideration, the ARFs for design point rainfall depths with durations equal to TC in a specific catchment appear to be fairly constant between 87% and 88%. Similar results were obtained by Pegram (2003), although Eq. (15b) differed slightly. Figures 11 and 12 served as a confirmation that there is no direct relationship between the R and M-values of the rainfall stations under consideration, as originally anticipated. The data points in these figures were randomly scattered around a curve to which a third-order polynomial relationship could not even be fitted satisfactorily, especially in the case of the Type 3 and/or 4 storm distributions. The degree of association between the R and M-values of the Type 1 and/or 2 storm distributions was higher compared to that of the Type 3 and/or 4 storm distributions, emphasising the more uniform areal and temporal distribution of rainfall, and associated lower occurrence of thunder, typical of the winter and/or coastal rainfall regions. The Thiessen polygon and isohyetal methods are the preferred methods to determine average areal design rainfall depths; especially where rainfall stations have a poor areal distribution and the catchment topography is highly variable. However, the isohyetal method requires much more data manipulation in an ArcGISTM environment with longer associated computation times. The Thiessen polygon method is therefore recommended for future use. 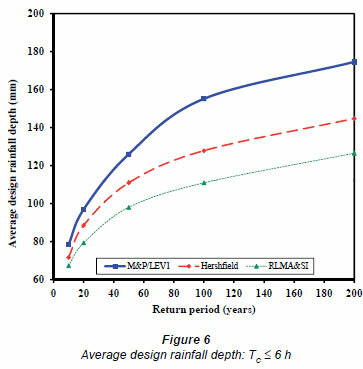 On average, the M&P/LEV1 relationship estimated the largest design rainfall depths for all of the return periods and critical storm duration ranges under consideration, except for the 10- and 20-year return periods of the 24 < TC< 168 h range. The Hershfield/RLMA-SAWS relationship estimated the second highest design rainfall depths for the full range of return periods of the TC< 6 h and 6 < TC<24 h ranges. On average, the lowest design rainfall depths were estimated by the RLMA&SI relationship, except in individual cases where the critical storm duration exceeded 100 h. Here, it resulted in higher estimates compared to those of the other 2 DDF relationships. However, in 57% of the catchments with TC< 100 h at the 200-year return period, the M&P/LEV1 relationship provided more accurate estimates. On average, these different DDF relationships demonstrated a high degree of association amongst each other, with r2-values ranging from 0.71 to 0.93 for critical storm durations less than 6 h. The critical storm durations ranging between 6 and 24 h were characterised by constant r2-values of 0.53 between the M&P/LEV1 and Hershfield/RLMA-SAWS relationships, while the degree of association between the Hershfield/RLMA-SAWS and RLMA&SI relationships decreased with an increase in return period. The critical storm durations ranging between 24 and 168 h were characterised by an acceptable to high degree of association between all of the methods. The results also showed a tendency to decrease in association with an increase in return period. Since all of these DDF relationships, except for the RMLA&SI approach, are currently widely used as standard rainfall input information to the deterministic flood estimation methods used in South Africa, the question arises whether this must remain as the standard procedure. Based on the results obtained from this study, it is recommended that the M&P/LEV1 and Hershfield DDF relationships should be seen as conservative estimates and their use should be limited to small catchments (TC< 6 h). However, the Hershfield/RLMA-SAWS relationship proved to be more reliable in medium-sized catchments (6 < TC< 24 h). The RMLA&SI approach must be used as the standard DDF relationship for all of the critical storm durations under consideration, since it utilises the scale invariance of growth curves with duration, and the Java-based software with graphical interface enables reliable and consistent design rainfall estimation in South Africa. In addition, by implementing this, the current M&P/LEV1 relationship, which depends heavily on averaged regional conditions, and the Hershfield relationship, with the highly variable and questionable parameter - the average number of thunder days per year, can be excluded from the calculation procedures. Eq. (15b) can be satisfactorily used to determine TC associated with any catchment area under consideration in the study areas. >In addition, the simplified ARF relationship expressed by >Eq. (16) can be used instead of Eq. (12) to convert design point rainfall depths or intensities to average areal design rainfall >depths or intensities in the identified catchments. However, the validity of both Eqs. (15b) and (16) must be further tested, improved and verified to be acceptable for general use on a >national scale in South Africa. 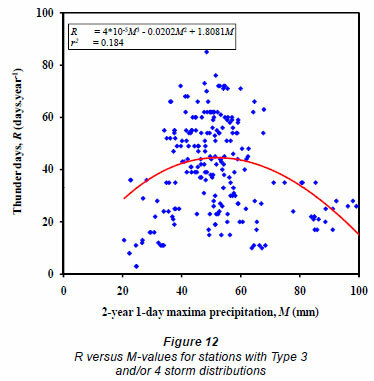 There was no clear relationship between the average numbers of days per year on which thunder was heard (R) and the 2-year mean of the annual daily maxima rainfall (M) values. The number of thunder days per year is not only influenced by the temporal distribution of storms; the climate, type of rainfall, areal distribution of rainfall, location, altitude above mean sea level and topography must be taken into consideration. Received 8 December 2010; accepted in revised form 5 September 2011.